Submitted photo Fairborn Mayor Paul Keller proclaimed May as “Motorcycle Awareness Month” throughout the City of Fairborn. Member of the Chapter F of Gold Wing Road Riders Association were present to accept the proclamation. Fairborn Mayor Paul Keller proclaimed May as “Motorcycle Awareness Month” throughout the City of Fairborn. Member of the Chapter F of Gold Wing Road Riders Association were present to accept the proclamation. https://www.fairborndailyherald.com/wp-content/uploads/sites/50/2018/04/web1_councilmotocycleproclam.jpgSubmitted photo Fairborn Mayor Paul Keller proclaimed May as “Motorcycle Awareness Month” throughout the City of Fairborn. 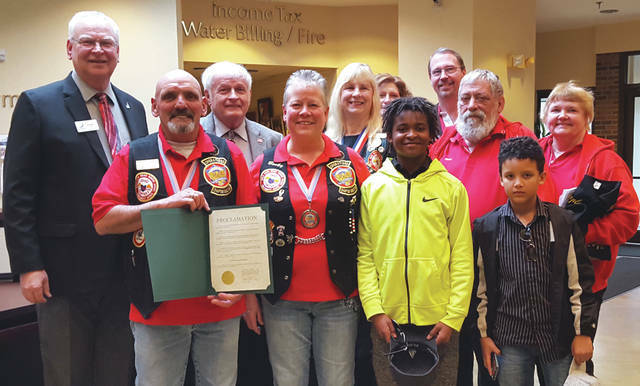 Member of the Chapter F of Gold Wing Road Riders Association were present to accept the proclamation.